thiruvAimozhi – 7.6.2 – enRukol sErvadhu? enRivai thAm mudhalA muRRumAy ninRa endhAyO! kunReduththu Anirai mEyththu avai kAththa em kUththAvO! em kUththA – oh one who manifested heart-capturing activities! My lord tended herds of cows and protected them by lifting the mountain; having all entities starting with five great elements which are earth, water, fire, air and ether, and all creatures with material bodies, as his prakAra (form); oh one who manifested such heart-capturing activities! When will I reach your divine feet which are attractive to be praised by [even] brahmA and rudhra? Alas! Implies “I, who seek no other benefit from you, have to call out to reach the divine feet which are easily approachable even for those seek other benefits from you”. enRukol – In the previous pAsuram, AzhwAr was just saying “enRukol sErvadhu” (when will I reach), desiring to be touched by his divine hand; as, there was no response from him, now he is saying [again] “enRukol sErvadhu” with great anguish! andhO – now, there will be no one who would call out saying “enRukol sErvadhu?” AzhwAr is saying that he will perish [soon]. By the tone of “andhO!“, he is revealing his deep distress. aran nAnmugan Eththum seyya nin thiruppAdhaththai – The divine feet which give joy to the destroyer as well as creator, without any difference. When will I, an ananyaprayOjana (one who seeks no other benefit), reach your divine feet which captivate even the prayOjanAntharaparas (those who seek other benefits)? When will I, who am fully focussed on you, reach your attractive, reddish, divine feet which captivate and make brahmA et al who are engaged in their own tasks to be fully focussed on you and praise? When will I reach your reddish divine feet which are praised by rudhra and brahmA? nilam nIr … – Unlike a step-mother who cares for the child which is already born, acting like a real [biological] mother who will prepare/suffer even prior to giving birth to the child, before srushti starts with thrivruth karaNam (mixing of 3 primary elements – earth, water and fire) and ends with panchI karaNam (mixing of five elements – earth, water, fire, air and ether, to engage in creation), creating them all, pervading into the created entities through jIvAthmAs, for their existence and differentiating by name [and form] and such aspects. By “muRRum Ay ninRa” (being fully themselves), his being the meaning for the combination of achith (matter), jIvAthmA (soul) who is the caretaker for achith and the paramAthmA (emperumAn) who is the antharyAmi of jIvAthmA, and how any of those achith will eventually lead to the paramAthmA who is pervading inside, is indicated. endhAyO – The relationship which is the cause for such care is explained. AzhwAr is saying that after creating the entities, emperumAn does not leave them to fend for themselves during dangers; instead, he toils to a great extent for their protection. kunReduththu – He lifted the mountain and protected them. Anirai mEyththu – While protecting, he protected the cows fully without any restrictions. 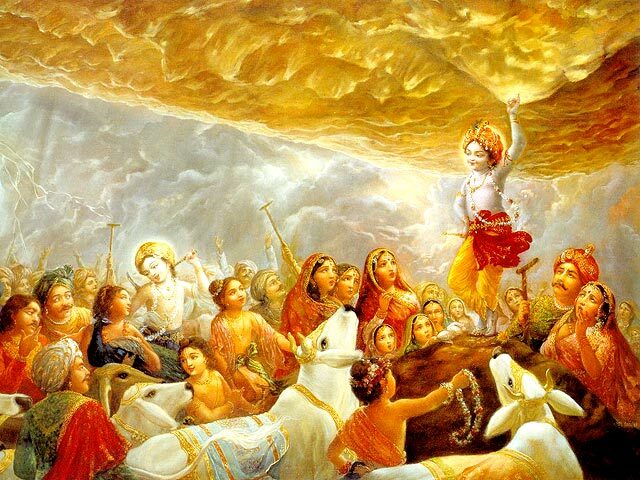 avai kAththa em kUththAvO – he lifted the mountain to protect the cows which were affected by the rain; at that time, he stood in a thribangi [with three bends] form; as that form looks very attractive like that of an expert dancer, for AzhwAr, he says “em kUththAvO“. Thus, with the previous pAsuram and this pAsuram, his attractive nature and being the goal is explained; with the next five pAsurams, his being the means will be explained. This entry was posted in thiruvAimozhi, thiruvAimozhi 7th centum on September 17, 2018 by Sarathy Thothathri.